Welcome to our classic selection of Indian food recipes where you'll find something here for everybody whether it be spicy, vegetarian, meat, speedy etc. The bread recipes are some of my favourites on this site, probably because I fell in love with the different Indian breads when I was in India. 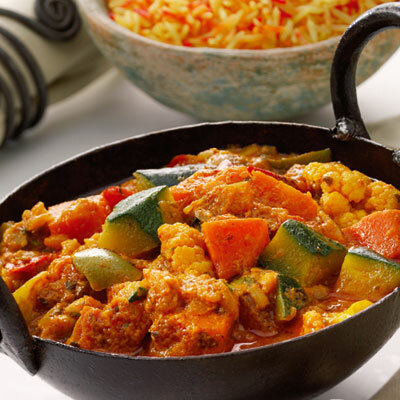 Of course India is famous of for its vegetarian food so most of the recipes here are vegetarian varying from just a simple vegetable curry to some beautiful but slightly more complicated dishes. Please feel free to add your comments and suggestions to the recipes, they are all welcome! Go to the relevant Indian food recipes below and choose you meal. Also don't forget our excellent method of cooking Basmati rice! A selection of some of the most popular Indian bread recipes for you to try. Very quick and easy to make and with simple basic ingredients. Find all the best Indian Rice recipes hereincluding some classic Pilau dishes and agreat selction of easy rice recipes. Indian Dals or Dhals, as theyu are also known are kind of like a lentil soup. Every region has a million different Dal recipes and I am sure that there is an endless amount of variations. From Tandoori Chicken, butter chicken, chicken gravies, curries, sauces and tikkas, the chickens really do get a raw deal on this page! Vegetables are an incredibly important part of Indian food. In a country where meat can be hard to find, the Indian people really have come up with some creative ideas! A great selection of Indian lamb recipes for you to try. Lamb curries are always a hit at big family meals and dinner parites and I urge you to try the Rogan Josh, a true classic! A selection of favorite Indian food recipes chosen by you starting with a real classic! For the complete method on how to make one of the best recipes follow this link for this simple vegetable curry recipe. You ca make the best curry the world has ever seen but if you screw up the rice.. The first step is always one of the most important and often overlooked. So begin by washing you basmati rice with clean cold water. Next your rice needs to be soaked if you want it at its best. 20 minutes minimum is recommended but 90 is perfect. Follow the link for a guide on the how to cook basmati rice to find out what to do next. I hope you enjoyed this selection of Indian food recipes enough to share and leave a comment or maybe you want to get in touch and leave your own recipe!